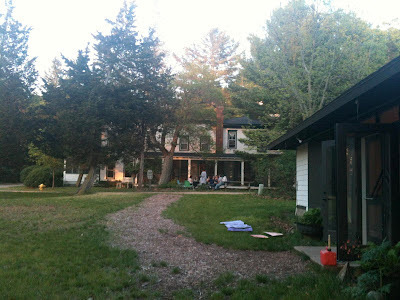 I was very fortunate to attend the Paper and Book Intensive this year, held at the Art Insitute of Chicago’s summer campus in Saugatuck, MI. Each time I attend PBI the experience gets better and better and this year was no exception. 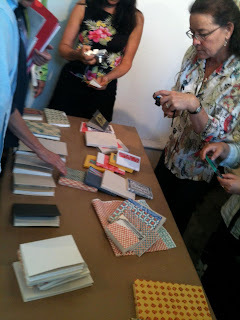 Among all the wonderful instructors, I took classes from Steve Pittelkow, Betsy Eldridge and Maria Fredericks. Below are some of my highlights from each class. 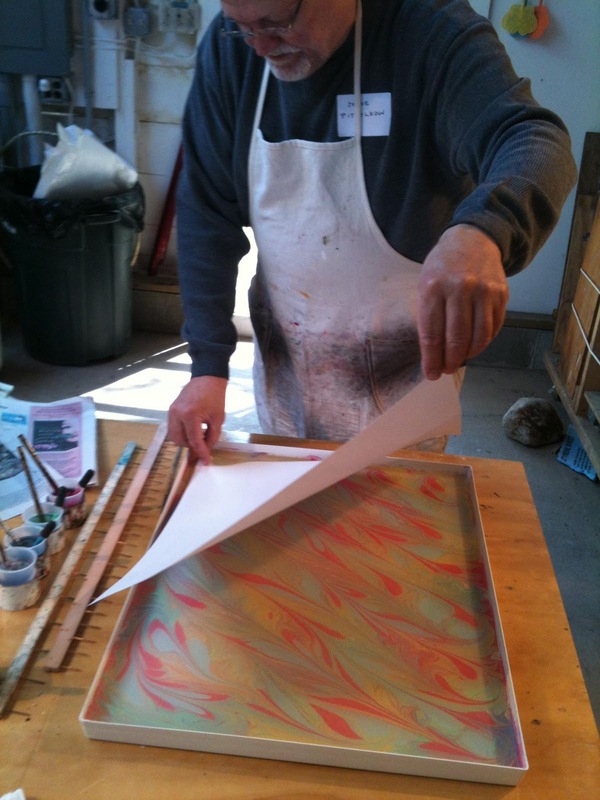 Steve's direct instruction style ensured that each student left with the knowledge of how to create some of the many basic marbled patterns found in historical papers. With a song in his heart, he led us through the various steps in creating simple to advanced patterns. 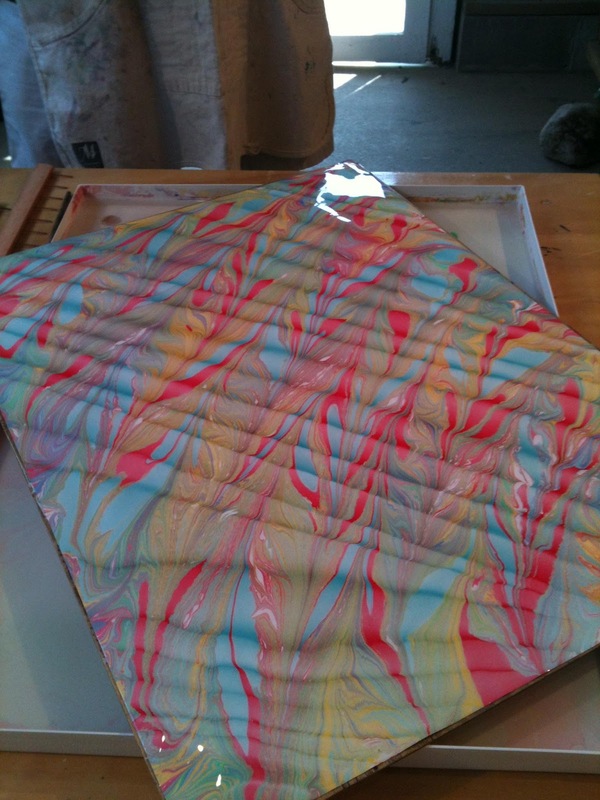 We were also able to experiment with our own designs and fancies. The aim for color distribution is random symmetry. 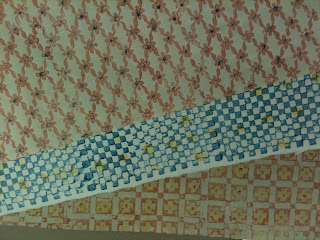 The more colors, the more intricate the pattern can be. After using a stylus to create a pattern, Steve lays down a sheet of alum-sized paper. This advanced technique is quite beautiful and gives a 3-D effect, called Spanish Moire. In this class I was able to construct a sampler of various ways to mount photos and other heavier material. Betsy graciously pre-cut much of the material so we were able to focus on the construction of our pages. For our final project we constructed a very complex album that incorporates an intricate arrangement of cloth hinges. It opens beautifully and very flat. Interspersed with our tasks at hand, Betsy gave us many tips and tricks. 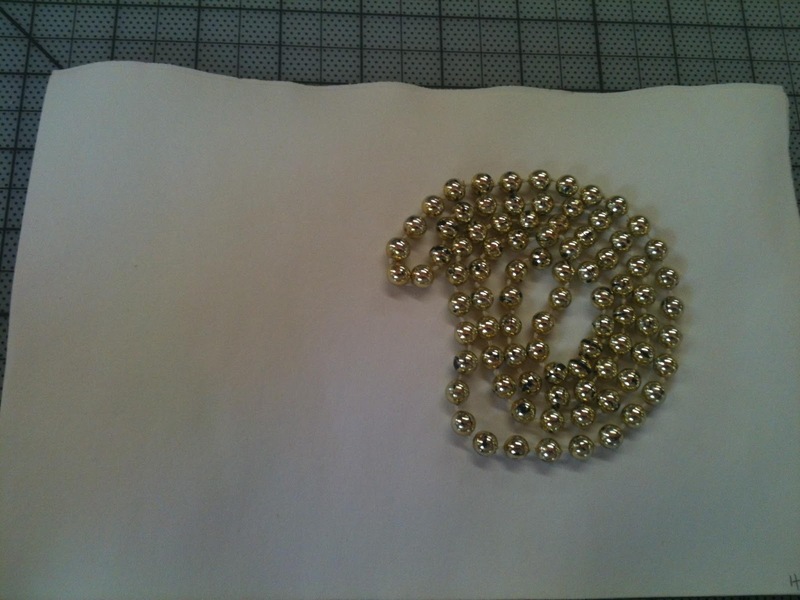 Here is a trick to burnish and soften paper: take some beads and roll them around in a circle moving over the surface of your paper. You’ll notice a dramatic difference afterward. 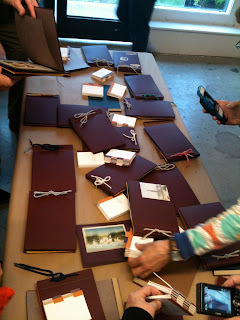 These are all of our completed photo albums displayed during show and tell. What I enjoyed so much in this class was the opportunity to explore and consider the function of the paper case in the context of history, and its diminishing quality over time. Looking at models representing the 15th to 17th centuries, it was clear how the sewing became abrreviated with the pressure to bind more in less time. 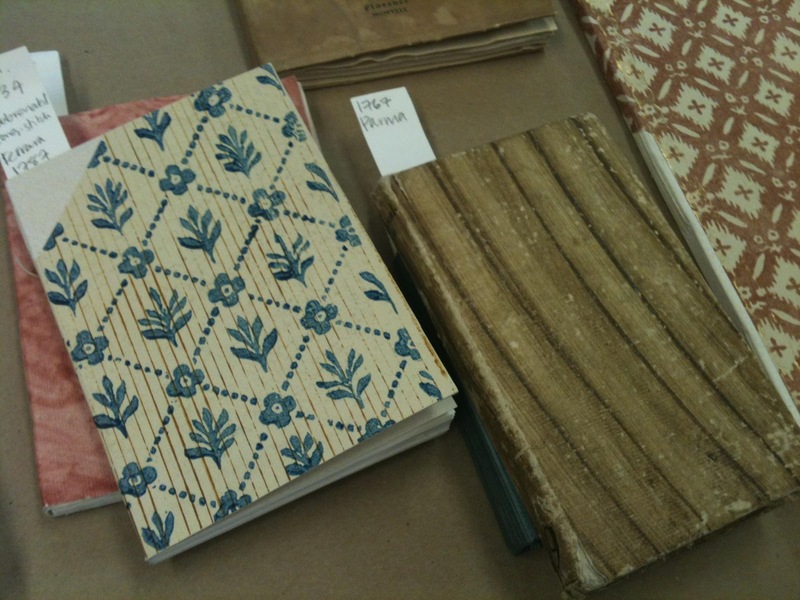 Many of the paper bindings have lovely decorated covers. 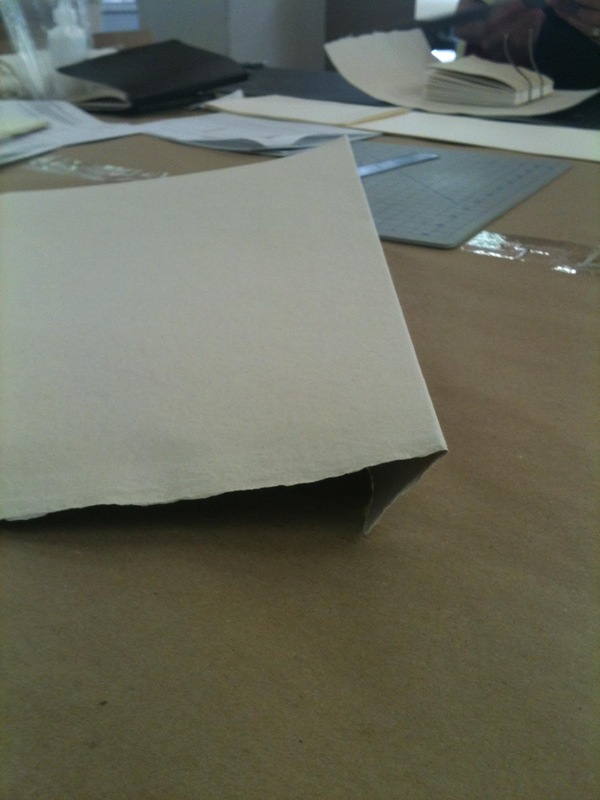 Often these printed covers are produced on thinner paper and then become a covering to the primary case. 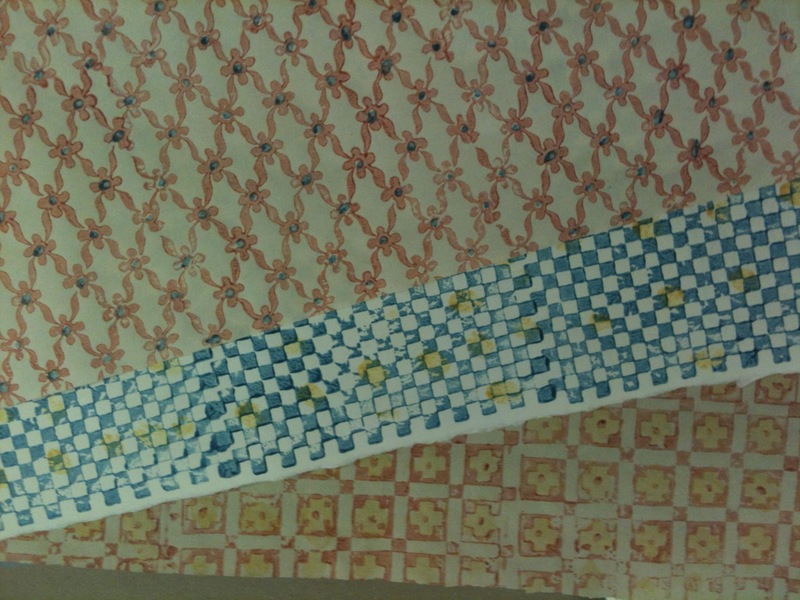 We made our own decorated papers using acrylic and blocks cut from a soft rubber. 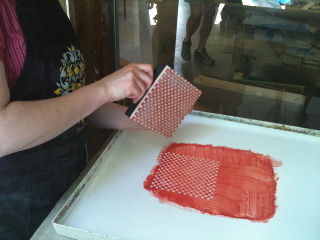 Firmly placing the block into the color. Printing the colored design onto our paper. 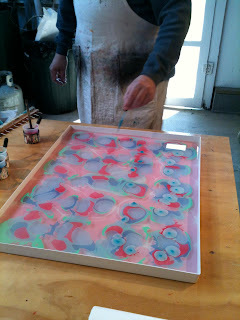 A second color can be hand painted in to add to the decoration. A tip I learned: When folding over a shorter edge, place that edge under the larger portion when making your final hard crease. This helps the shorter edge stay put. 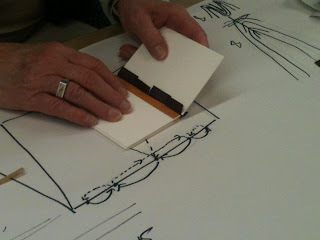 Maria demonstrates the steps to creating the case. 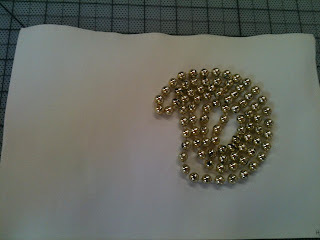 Lacing in the text block. 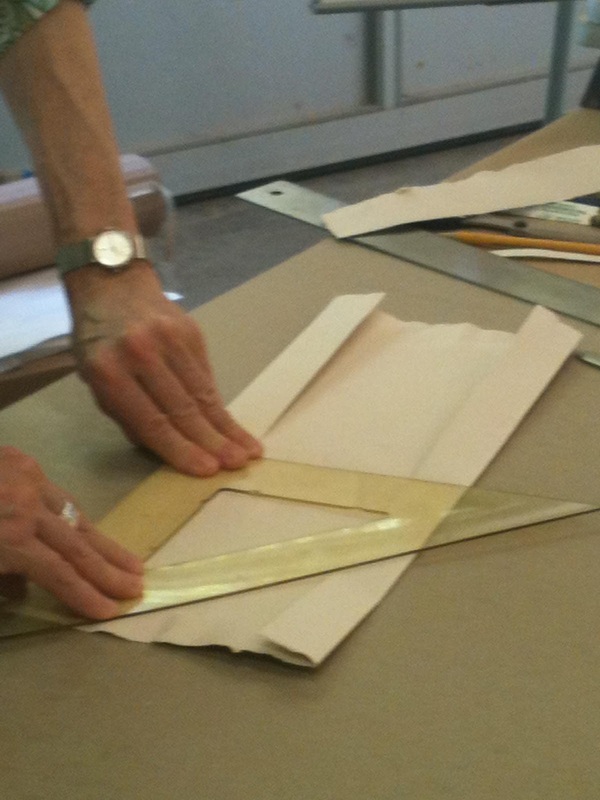 If a decorated paper is used, it is put on before the foredge turn-ins are completed. 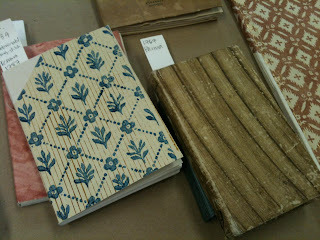 Here are some of our completed books. PBI is a wonderful and invigorating experience. 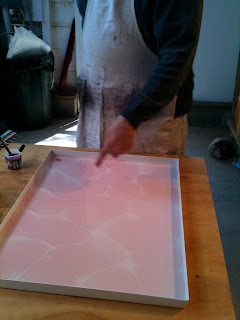 It brings together teachers, artists, conservators, paper makers, printers and more to exchange and share experiences and knowledge so that at the end everyone goes away with so much more than they came with, including new friends to connect to. Along with processing serial titles for commercial binding, I’ve been working on some in-house treatments for magazines and small pamphlets. Usually, serial titles are sent out to a commercial binder to be bound in hard covers. Occasionally however an in-house treatment is more appropriate. 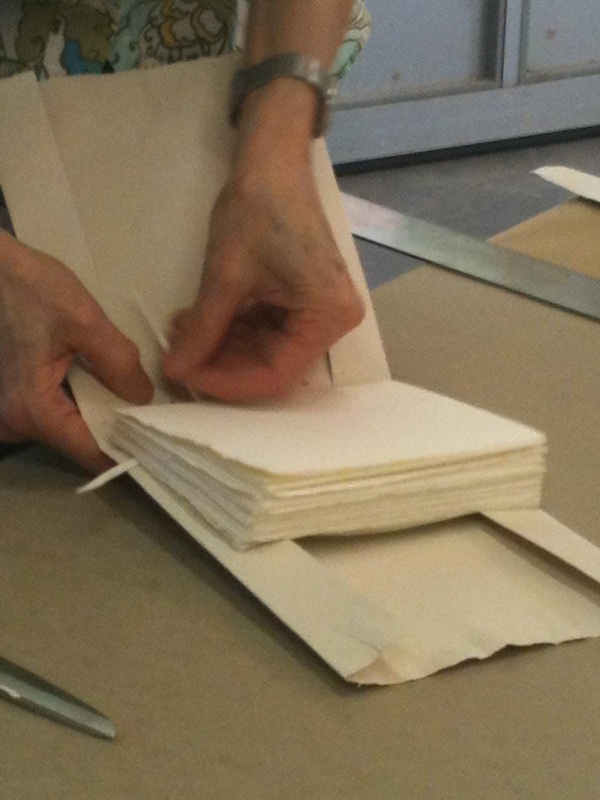 For example, the string binding, adapted by conservator Deborah Howe, is ideal for undersized or short-run serials that are printed as single section issues. 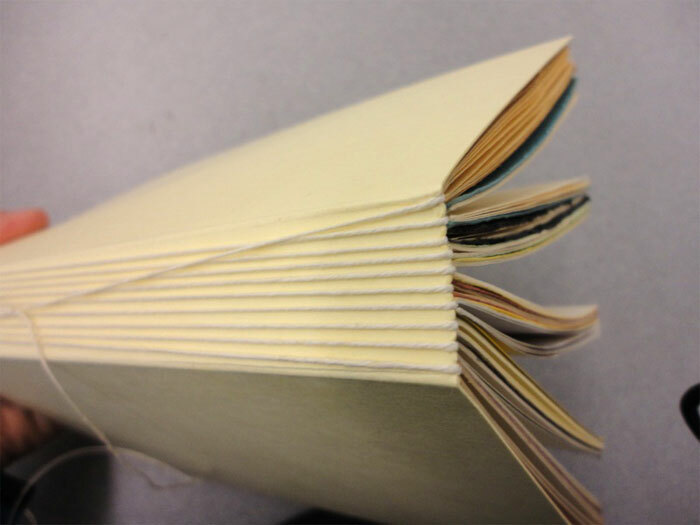 This aspect in particular, whether stapled or pamphlet sewn, is what makes the string binding an easy and fast way to bind multiple issues into a single volume. 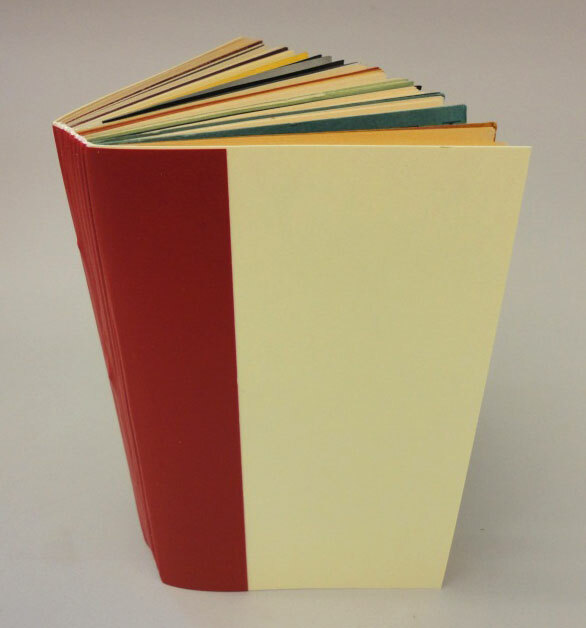 The string binding is made of a 20 point board that wraps around the issues, covering the front, spine, and back. Each issue is secured into the cover with a thick linen thread wrapped tightly around the spine section of the cover and through the center of the magazine. 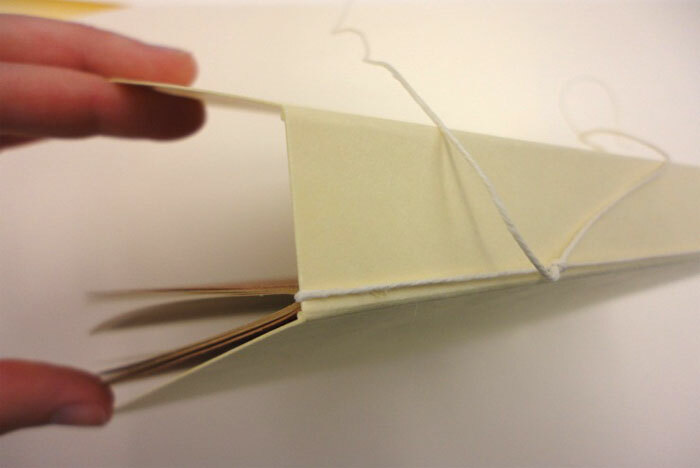 A separate piece of thread can be used for each issue or a continuous thread can be wrapped through each issue one at a time which saves time in tying knots. 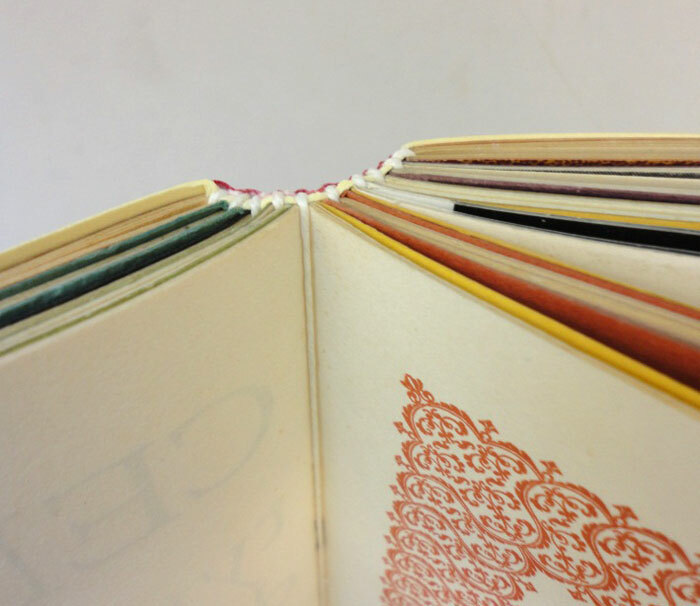 Once all the issues are attached into the 20 point cover a protective piece of book cloth is glued over the spine and strings. This adds support to the spine and front and back hinges. 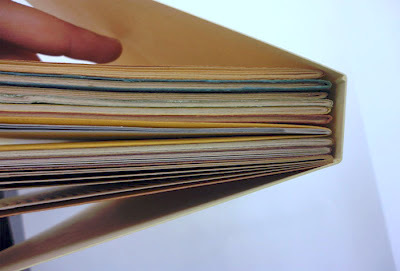 For volumes that are tall, heavy, or floppy it is best to reinforce the covers with a 40 point board on the inside of each cover. Like many conservators, tools interest me. They allow my hands to execute very specific actions in a more exacting fashion than they could alone. On the whole, a knife, for example, makes a cleaner cut than the tear made without one. 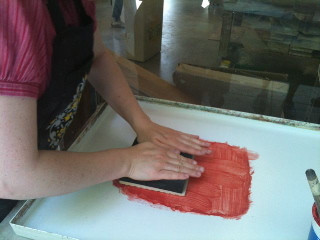 A spatula lifts a thin piece of bookcloth with more accuracy than a fingernail. It’s valuable to keep in mind that occasionally to tear is the better action than to cut—sometimes speed beats accuracy or the feathered edge is more appropriate. 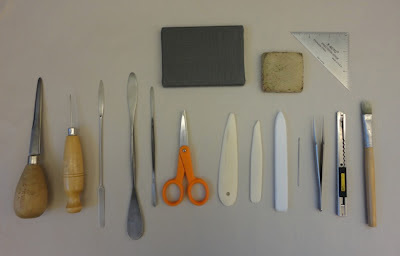 Pictured bottom row, left to right: staple remover, awl, microspatula, Casselli knife (larger), Caselli knife (smaller), scissors, bone folder, bone folder (smaller), Teflon folder, needle, tweezers, Olfa cutting knife, glue brush. 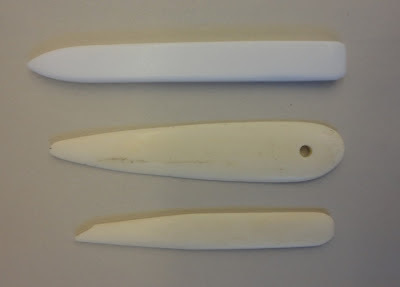 Top row, left to right: weight, rubber cement pick-up (crepe eraser), and 45-degree right triangle. 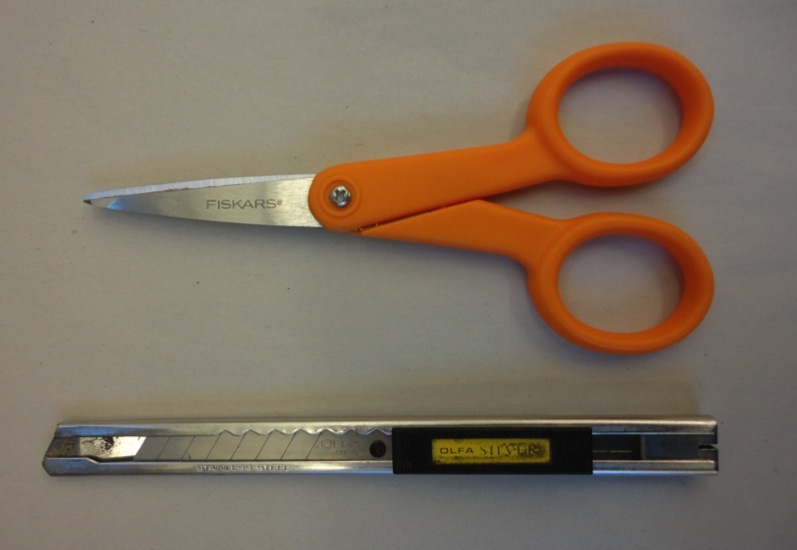 Not pictured: 12” and 18” rulers, large scissors. 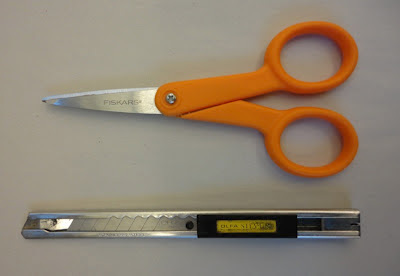 A small pair of scissors that cut all the way to the tip and a sharp, straight-bladed knife are both very useful tools. Sometimes you want a quick rough cut, and scissors are the perfect tool for the efficiency. Other times accurate cutting is essential, and a knife is the best option. Change the blade frequently, as a sharp blade is a safe one. A staple remover (top) can pry staples apart for removal without causing paper damage. 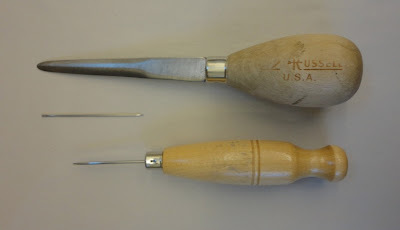 A bookbinding needle, whose eye is no wider than the body of the needle, will allow tighter sewing since the hole the needle makes will not be larger than the needle’s thickness. (The needle size should be in harmony with the thread size.) 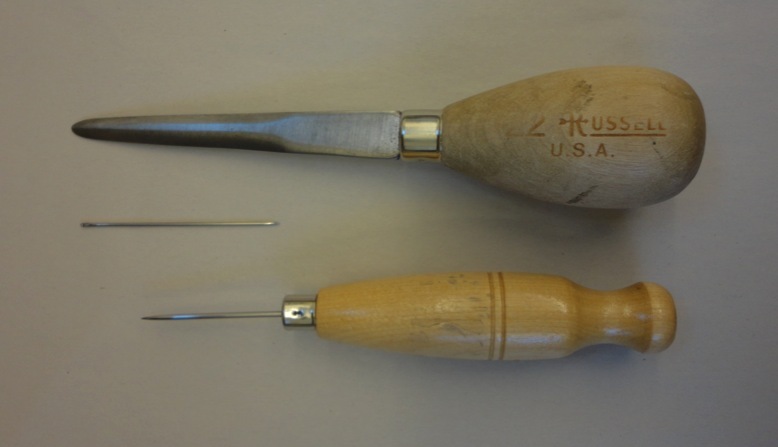 The awl (bottom) has a shaft of equal width its entire length allowing for piercing holes of a consistent size. The Casselli #4 spatula (top) is my usual tool for lifting leather or paper when rebacking a book, and it can also be used for spine cleaning. The blade is very thin, as is the blade on the small Caselli #2 (3rd from top), which easily gets into very small spaces. 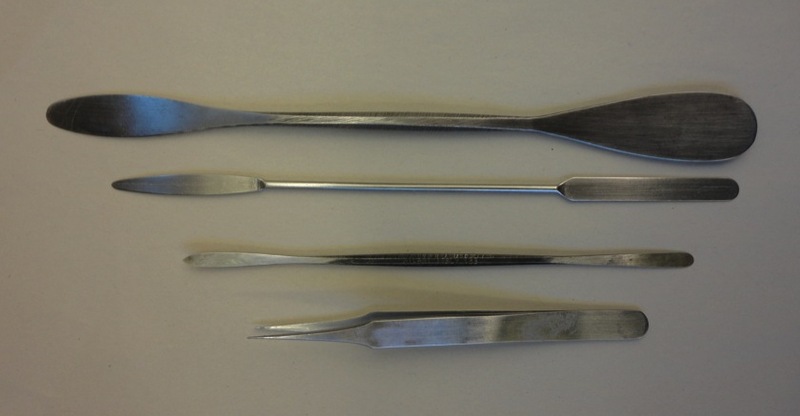 The microspatula (2nd from top) has a thicker blade, but still allows for the insertion of glue or paste in small areas. The tweezers (bottom), with their fine, pointed tip, assist with positioning Japanese paper in repairs and removing excess cloth in corners when making boxes. 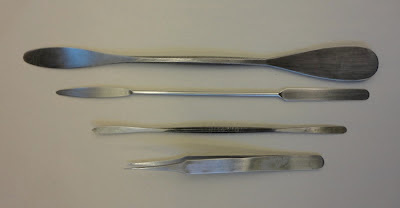 Recently, the blog of the Preservation Department at Parks Library of Iowa State University had a detailed post on microspatulas, including photos of them in action. Much of the work I do requires applying glue or paste to small areas; hence the small sizes of my glue brush (top) and paste brush (bottom). Both have brush tips about 1/2-inch in width. For box-making or gluing up large areas of paper or cloth, I generally use a foam paint roller for application (not pictured). 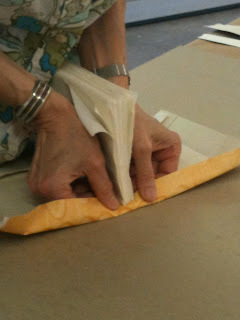 A small flat weight (a piece of steel covered with book cloth) holds work in place while sewing or drying. 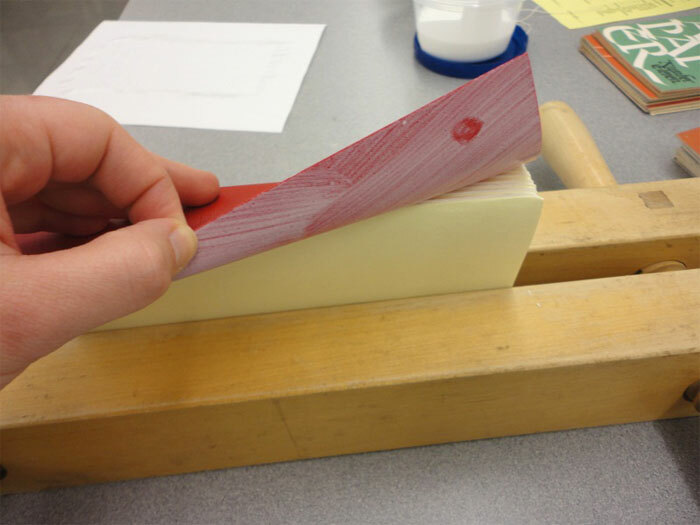 A rubber cement pick-up (also called a crepe eraser) will often get a stray bit of glue off of book cloth or paper. The small metal 45-degree right triangle is essential for box-making. It is also convenient for trimming small pieces of material on the bench, without requiring a walk to the board shear. If tools interest you too, then you may wish to follow Jeff Peachey’s blog. He writes about tools, as well as makes and sells them. Tools for bookbinding and conservation are available from a variety of vendors, including local hardware, craft, and stationary stores, as well as those businesses catering specifically to the conservation and binding fields. Additionally, the vendor room at the Guild of Book Workers Standards of Excellence Seminar each year provides a great opportunity to see a wide range of tools and supplies, and to support the vendors who keep the specialized items available to practitioners. The vendor room is open to all, not just conference attendees. A list of past vendors can be found on the Standards website. 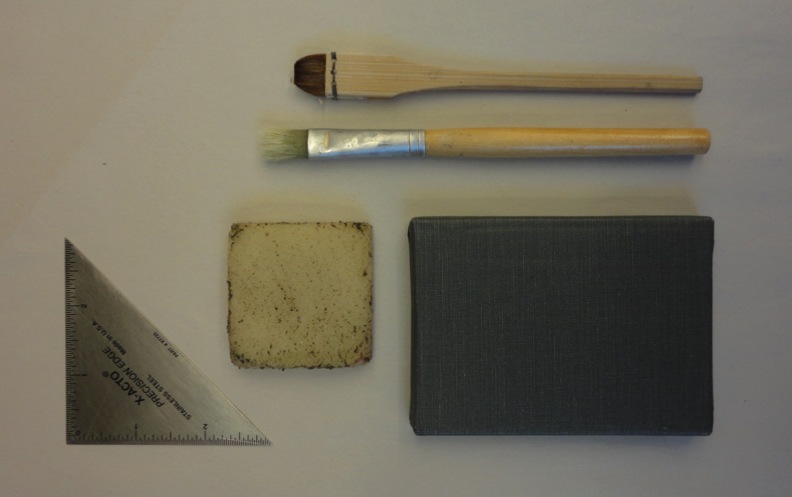 A list of supplies and services for bookbinding and conservation can be found here. For use. Sometimes patrons, scholars, or alumni want to view our old films. Of course we would love to support viewing of the films, but they aren’t always in good enough condition to be viewed on a projector. For reformatting. People often want to use clips from our film footage for other purposes. We also sometimes reformat film as part of the film preservation process, to allow people to easily view the content in a digital format. For accessioning. When we receive new (or new-to-us) films into the collection, a physical assessment is an important first step in determining how to best store and manage the items. Why is film condition assessment important? Well, films have some unique physical qualities that make them degrade in characteristic ways, often much faster than books and paper. The National Film Preservation Foundation has an excellent book on film preservation, which can be downloaded as a PDF for free. 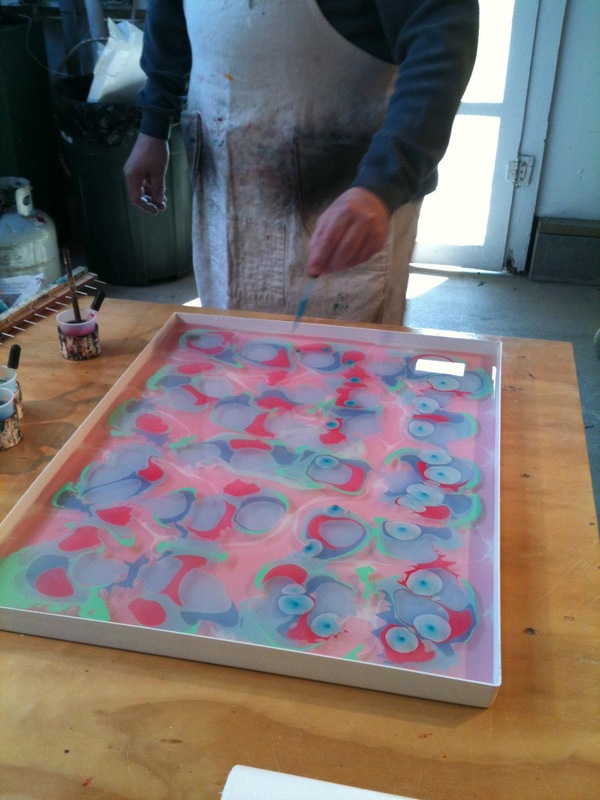 To sum up the basic issue, film is made of three parts: the image, which sits on an emulsion layer, which sits on a plastic base, and the type of plastic used for the base determines how it will degrade. Modern film bases are made of stable polyester, but historic film bases were made of either cellulose acetate or, originally, cellulose nitrate. Cellulose nitrate was used in the late 19th and early 20th centuries and is extremely dangerous because when it degrades it is highly flammable. Cellulose acetate or "safety film" replaced cellulose nitrate in the mid-20th century and, while not dangerous like nitrate film, it does decay in a way that causes irreparable damage to the film. The chemical process of decay turns the acetate into acetic acid (the acid in vinegar), which causes the film to shrink, warp, and turn brittle. It also emits a characteristic odor of vinegar, which is a sure sign that the film is decaying. The best way to slow film decay is to store films in good-quality containers in very cold, relatively dry environments. Films can also be digitized, transferred to a stable base, and made accessible using DVDs to prevent decay and damage from use. In a future post, I’ll talk more about the actual process of condition assessment. Stay tuned! Preservation Week 2012 has come and gone. How did you celebrate? There were a number of great activities all over the country – I hope you were able to participate and deepen your understanding of the need to preserve our cultural heritage today so that it may be passed on to the next generation. If you haven’t had a chance, be sure to review our preservation pointers. Dartmouth's major Preservation Week event was a public screening of the film Quetzalcoatl. You may recall from earlier posts (here and here) that funding for the film restoration was provided by a grant from the National Film Preservation Foundation. Part of the mission of the NFPF is to promote film exhibition and so projecting the film before an audience was a grant requirement. Quetzalcoatl was ready for public viewing at about the same time that our colleagues at the Hood Museum of Art were preparing a major exhibit, "Men of Fire: Jose Clemente Orozco and Jackson Pollock". We decided to schedule the premiere during the "Men of Fire" exhibit (April 7 – June 17) and serendipitously Preservation Week fit right in. The director’s use of pan and scan to emphasize parts of the mural. The impact of the musical score by Theodore Newman. What parts of the mural the director included and what was excluded. What a difference it made to experience Quetzalcoatl on the big screen! After the movie, Professor Coffey took questions from the audience and many commented that the film helped them better understand Orozco's work. One person stated that although he had studied the mural, he had never before been able to see at eye level the figures of Quetzalcoatl and the Christ in the way the film maker made possible. If you would like to view the movie, a DVD copy may be checked out from the Jones Media Center. Ask for Jones Media DVD 13348. Or you may see it on Dartmouth's YouTube channel. If you are in the Upper Valley, be sure to visit the Hood Museum of Art at Dartmouth College to see the "Men of Fire: Jose Clemente Orozco and Jackson Pollock" exhibit from now until June 17. Though Eleazar Wheelock is well remembered as the founder of Dartmouth College, it’s largely thanks to the efforts of Mohegan Native American minister and intellectual Samson Occom that Wheelock’s dream was made reality. And while Occom’s role in the founding of Dartmouth was undoubtedly crucial, the Occom Circle Project intends to assert his rightful place as an important voice in early American history as well. With the help of Professor Ivy Scheweitzer, Rauner Library, Computing Services, the Digital Production Unit, Preservation Services, and many other departments and individuals, we are nearing the project's goal. In 1743, Eleazar Wheelock met a young Mohegan named Samson Occom. Occom had been taught English by missionaries at a young age, and had already converted to Christianity. During the four years they initially spent together, Wheelock found Occom to be an excellent pupil, and he successfully prepared Occom to be ordained as a minister. Occom, for his part, encouraged Wheelock's goal of educating and enriching the lives of the Native American population. This bore fruit in 1755, when Wheelock founded Moor’s Charity School in Lebanon, Connecticut, which accepted both Native American and British students on charity. By then Occom had already departed from Wheelock's instruction to seek his own fortune. 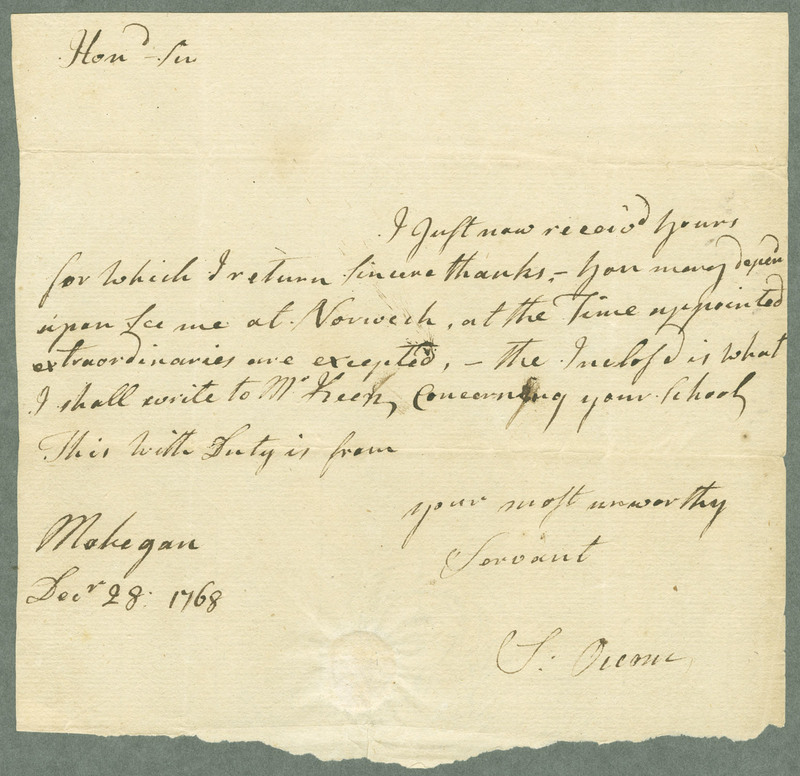 In 1749 Occom was offered a position as the schoolmaster for the Montauk Native Americans on Long Island. It was there he met his wife, Mary Fowler, and started a family. In 1759 he was ordained. 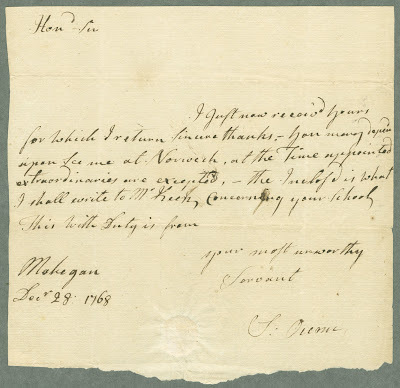 Occom spent the next several years traveling New England as an itinerant minister, first as a missionary to the Oneida Native Americans and eventually returning to the Mohegan tribe in 1764. It was here that his path crossed yet again with Eleazar Wheelock; a meeting that would have a profound and lasting effect on the Upper Valley. At this time the Moor’s Charity School was financially troubled. Wheelock had had small success fundraising throughout New England, but it was not enough. What he proposed was a fundraising trip to England, to be undertaken by his most accomplished pupil. Occom agreed. He was joined by the Reverend Nathaniel Whitaker. The pair left for England in 1766, and after two years they had raised over £12,000, a truly substantial sum at the time. 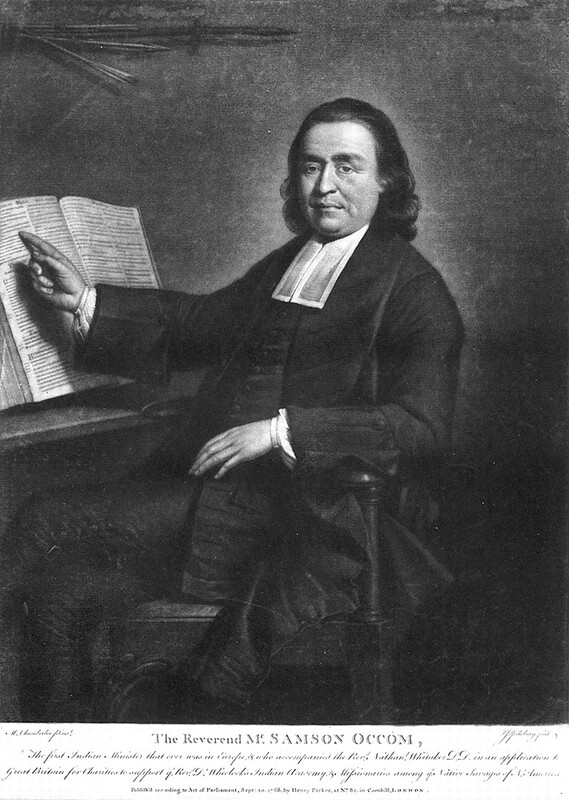 As Francis Lane Childs wrote in the Dartmouth Alumni Magazine: "[A]n Indian preaching in the pulpits of English churches was naturally a sensation, and large throngs came to hear him and his colleague. The subscription papers which they carried were filled with all the way from small contributions... to ones of considerable amount from wealthy, pious-minded persons. In fact, they ranged all the way from 5 shillings given by an anonymous widow to two hundred pounds donated by King George III himself. One of the gentlemen who headed the list was William, Second Earl of Dartmouth. Another was a philanthropic and well-to-do merchant of London, John Thornton." It is safe to say that without this fundraising on Occom’s part, the founding of Dartmouth would have taken substantially longer, or indeed, may not have been possible at all from Wheelock’s position. In 1769 the school charter was signed by Governor John Wentworth, and true to its roots in the Moor’s Charity School, it declared "that there be a college erected in the province of New Hampshire by the name of Dartmouth College for the education and instruction of youth of the Indian tribes in this land in reading, writing, and all parts of learning which shall appear necessary and expedient for civilizing and Christianizing children of pagans, as well as in all liberal arts and sciences, and also of English youth and others...[It shall not] exclude any person of any religious denomination whatsoever from any of the liberties and privileges or immunities of the said College on account of his or their speculative sentiments on religion." In June of 2010 Dartmouth English Professor Ivy Schweitzer was awarded a grant from the National Endowment for the Humanities to establish an online archive of Occom's writings. Schweitzer's project began in 2005, when, teaching a first-year seminar, she had difficulty providing access to Occom's letters for her entire class. The solution of the online archive accomplishes this, as well as making the history of the college (and Occom’s role within it) accessible to a much wider audience. Schweitzer said: "This puts Occom at the center of a larger cultural movement in which you can see how important his work is." The letters themselves are currently available in a beta website, with a finished version projected for 2014. 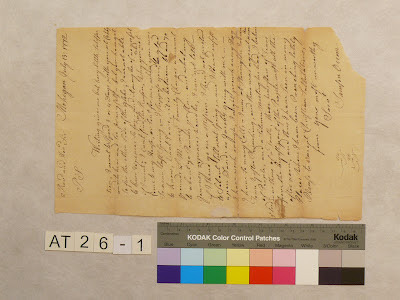 The Occom collection presented some interesting challenges; first and foremost there is the lack of an actual collection, with the 500-plus letters and manuscripts culled from other areas of Rauner Library and assembled specifically for this project. It's up to College Archivist Peter Carini and his team at Rauner Library to make sure the articles are genuine and the information is up to date. The letters then arrive at the Preservation Services department, where our Collections Conservator Deborah Howe does everything possible to conserve and keep these documents in optimal condition. Torn documents are mended with Zen Shofu paste, a wheat-based adhesive, as well as Japanese tissue, which is tinted in an acrylic bath to best match the original documents' hue. In some circumstances a very thin gossamer tissue is used in order to best preserve the fidelity of the text. 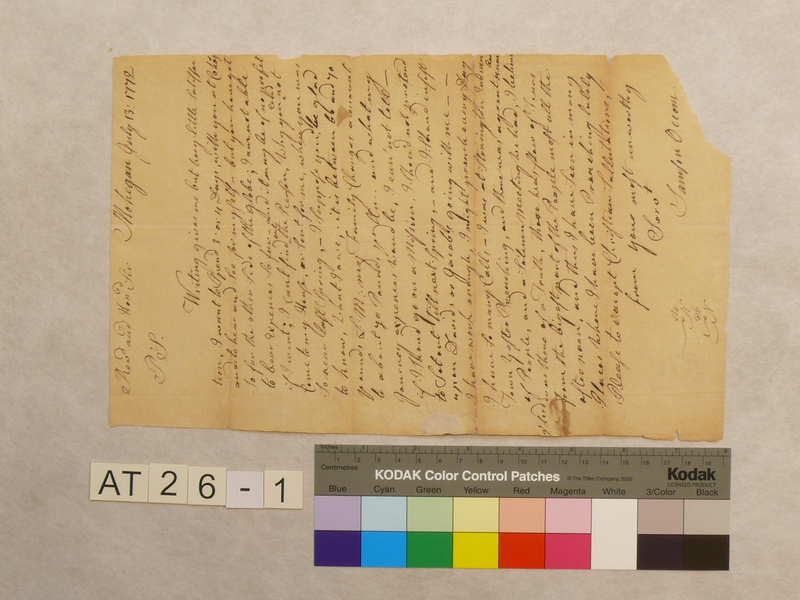 After Preservation Services has repaired the documents they come to the Digital Production Unit, where they are scanned and added to the temporary online database. From there, Project Manager Dawn Dumpert, Professor Schweitzer, and a rotating cast of student workers transcribe and mark up the documents in TEI (Text Encoding Initiative). 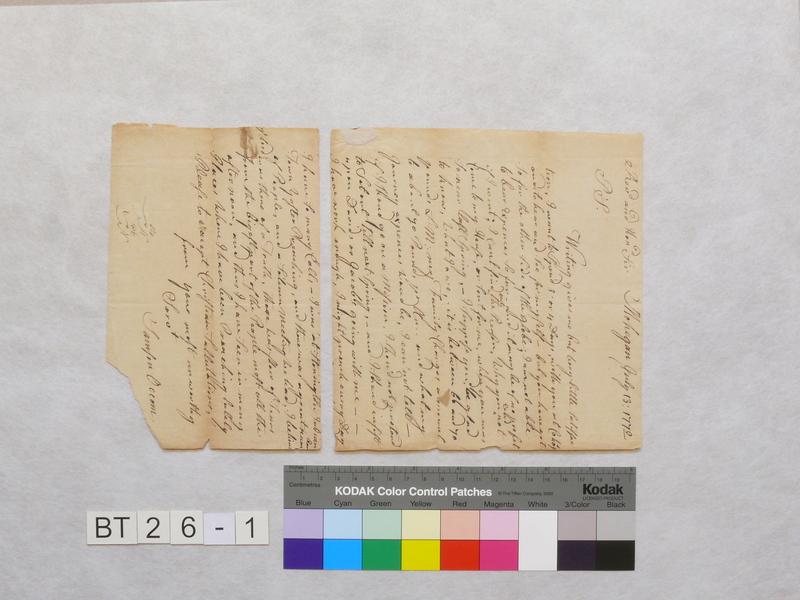 The document then goes to Cataloging and Metadata, where Text Markup Unit Manager Mina Rakhra's team creates a cataloging record and applies metadata to the newly-scanned documents. For the finished product, Paul Merchant in the Digital Library Technologies Group is working on the search features, and Susan Lee in Computing Services is working on the design of the website. This project represents both a major step forward in early-American cultural history, and an example of how well the various library and faculty members can collaborate. It’s safe to say that without the exceptional work of Professor Ivy Schweitzer, Rauner Library, the Digital Production Unit, Cataloging and Metadata Services, the Digital Library Technologies Group, Computing Services, and the Preservation Services department, this project would not have been possible. 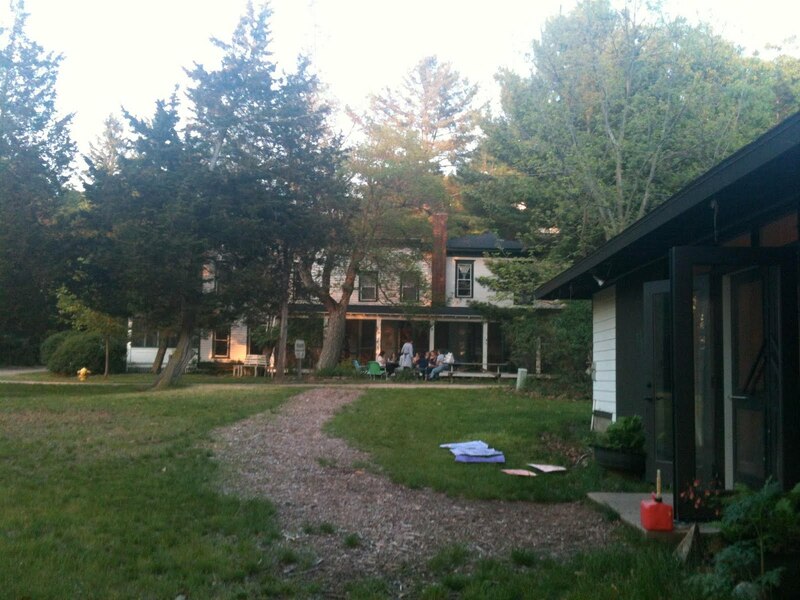 Preservation Week: April 22- 29, 2012. 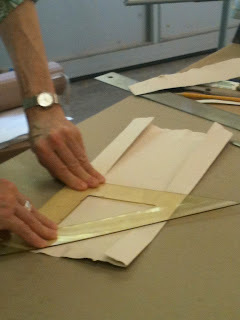 This week on the blog we're highlighting Preservation Week with daily pointers for preserving your personal collections. With the devastation of last year’s flood still lingering and the cleanup ongoing, it is vital that we keep in mind one of the most damaging aspects of flooding: mold contamination. Preservation Week at Dartmouth College Library is part of an annual event sponsored by the American Library Association to raise awareness of preservation issues and solutions. For more information visit our website.